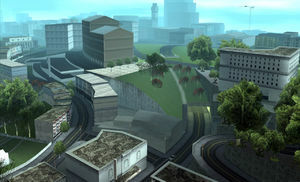 Queens is an area of San Fierro, which is Grand Theft Auto: San Andrea’s version of the Castro District of San Francisco. 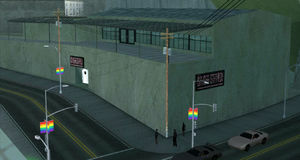 Like the Castro, Queens is the game’s “gay neighborhood” (the only one in the game series). The neighborhood is marked with rainbow banners on the lightpoles and gay-owned or gay-frequented businesses like the Gaydar Station (image below) and the Uphill Gardener Garden Center.